There aren't an infinite number of ways a 19-year-old Brown University student can get a book contract. 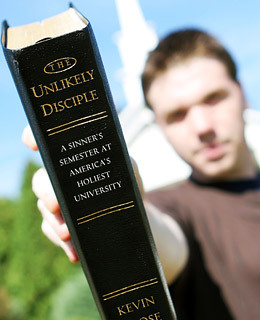 Going undercover as a student at the largest evangelical college in America is one. Kevin Roose spent a full semester at Liberty University in Virginia, founded by the Rev. Jerry Falwell, making friends with Bible-toting students, singing in the choir and getting an evangelical education  foreign territory indeed for a representative from one of the most fastidiously liberal schools in the nation. He even had an opportunity to interview Falwell himself, shortly before the pastor's death. Roose brought a secular perspective to the experience, which he said he undertook to help understand the evangelical movement. Of course, becoming a published author before you graduate college is nice too. See pictures of a drive-in church.